Sunday morning started off with a breakfast date with my mom! O-hop (Original Pancake House) is one of my favorite breakfast places and I was excited that we’d be going there! 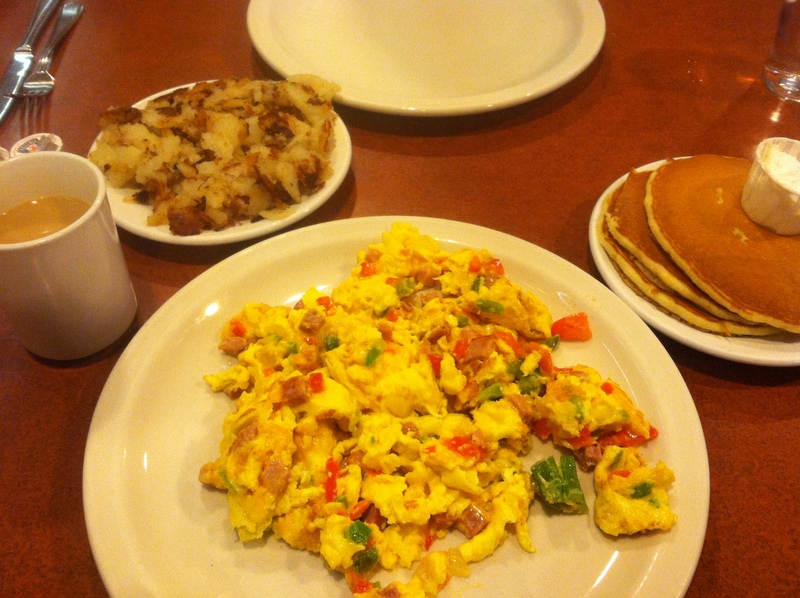 I ordered the western omelet with: onions, peppers, ham and cheese. I went with their world famous pancakes on the side and some fried potatoes! I thought Carries gown looked gorgeous on her! The detailing was out of this world! Taylor is always one of my favorites on the red carpet! She always picks the most gorgeous gowns and this white one is fabulous! For the men I thought Justin Timberlake looked so handsome, I mean come on who doesn’t love some 30’s style glamor Adorable. What’d y’all think of Beyonce rockin’ the black and white jumper? I know they had a dress code but this is kinda of conservative for Beyonce. I have to say if anyone could pull it off it was Beyonce! I loved all the diversity in performances but I have to say Ed Sheeran and Elton John was my favorite! Love me some Elton John. The Bob Marley tribute was also top notch! I don’t usually use my blog as my soap box but I’m going to right now; I was extremely extreeeemelyyy disappointed that Rhianna attended and cuddled with Chris Brown. It was four years ago that Chris Brown was arrested for domestic violence for beating her. Believe me I’m all for forgiveness and moving on but being such a public figure I think you need to be careful. The message it sent to her fans was that domestic violence is okay, and she has a lot of young fans who are very impressionable. Sorry for that rant but I felt it was necessary! The rest of my night will be spent watching The Bachelor and giving myself a pedicure. Enjoy your night! How do you feel ab0ut the Rhianna/Chris Brown situation?